Disney's Pirates of the Caribbean "Hoist High the Jolly Roger" Kit, by MPC. Generally thought to be one of the rarest of the series of "Zap - Action" kits that MPC released back in 1972 based upon animatronic tableaus from the popular Disneyland theme park ride...predating the movie series by many years. These plastic model kits are EXTREMELY hard to find and have not been in issue for over 37 years!! This one features a CLASSIC swaggering pirate ("Captain Villainy") defending his chest of booty, brandishing his cutlass about (Zap - Action!) while waving the "Jolly Roger" flag. You have the option of building the pirate with a living, skin-stretched face, or with a haggard, dried-up skeleton head. ARRRRR!!! Reminds ol' Mr. Pop Top of those great car model kits of the 60's that could be built with SKELETON drivers in place of the regular driver figure...but, alas, I digress. Wallowing in nostalgia. This swashbuckling kit is MINT-IN-BOX and UNBUILT, PARTS STILL TREED. Excellent condition! Complete!! As with others in this series, Mr. Pop Top has seen JUST THE INSTRUCTION BOOKLET from this kit bring huge amounts on e-bay! 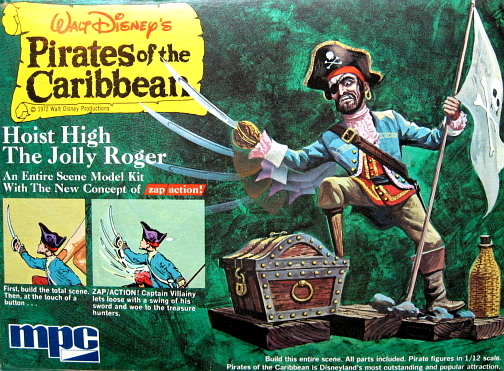 These "Pirates of the Caribbean" kits came out when Johnny Depp was a mere lad of 9, and have NEVER been reissued! Aye, such a pity, mates...makes for a real rarity, eh? Tarry not, lubber, lest yer bones be picked clean by the land crabs!! Only this one be in stock. Shiver me timbers! !